Oracle Cloud Platform with its Oracle Platform-as-a-Service (PaaS) provides services in a cloud platform. The main component of the PaaS is Oracle's Database-as-a-Service (DBaaS). In Q3 2016 Oracle upgraded the DBaaS to Oracle Database 12c R2. 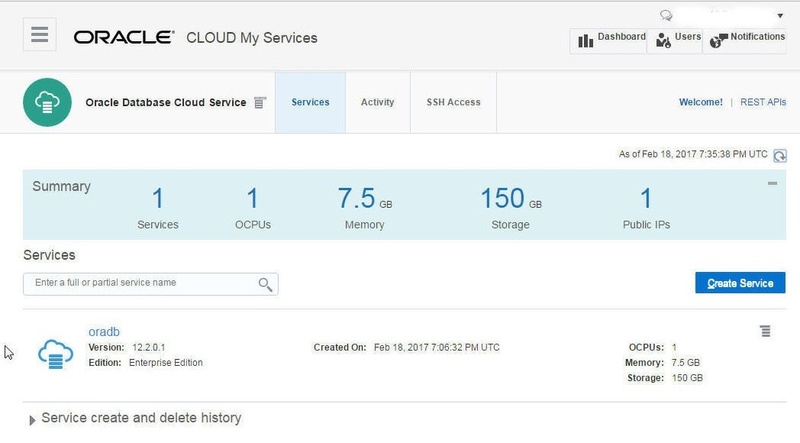 Oracle also made available several other new cloud services including the Oracle MySQL Cloud service, which was discussed in an earlier article. 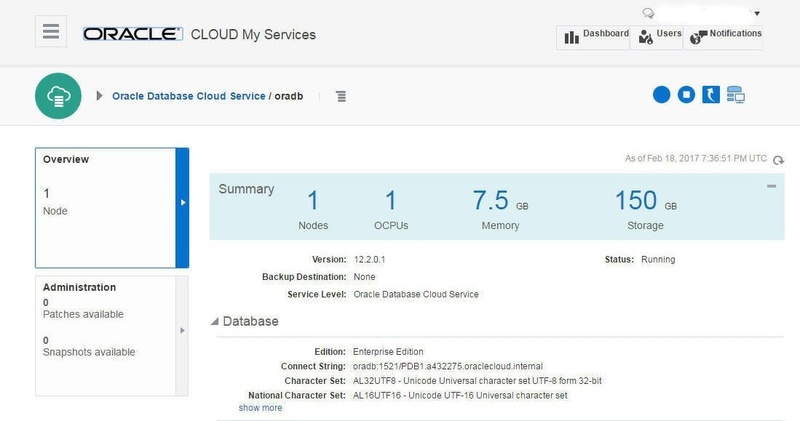 Oracle's Data Integration Cloud Service offers data ETL (extract, transform, and load) and data replication features for workloads that process data across the PaaS services, including Oracle Database as a Service and Oracle Big Data Cloud Service. Oracle Big Data Cloud Service supports big data frameworks such as Apache Hadoop and Apache Kafka. 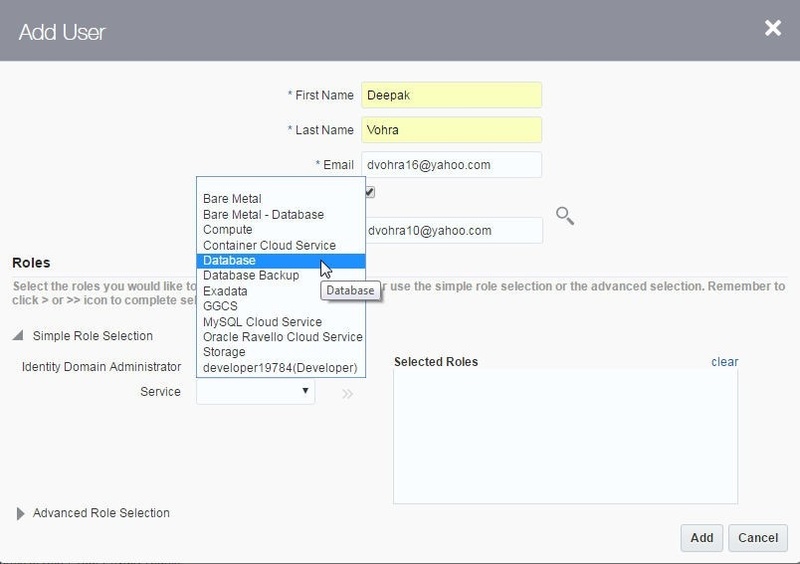 Oracle NoSQL Cloud Service is designed for NoSQL applications. Oracle Big Data SQL Cloud Service spans over the big data stored in Apache Hadoop, NoSQL databases and Oracle database to provide a SQL query service. 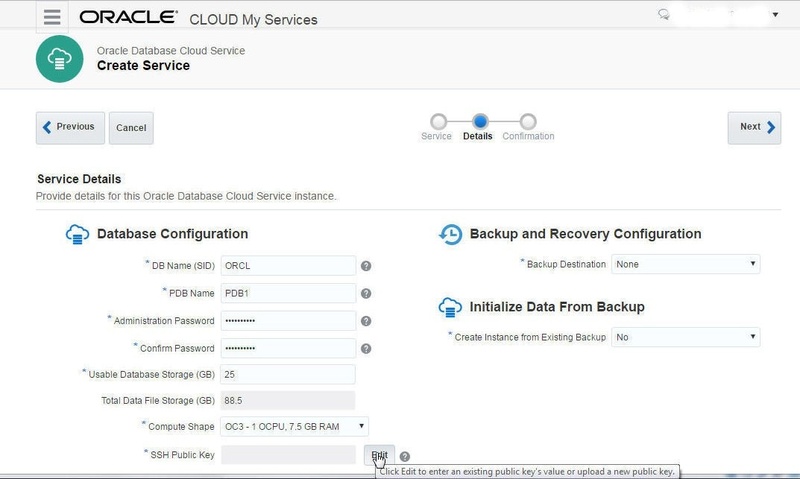 To use the Oracle Database as a Service (DBaaS) a subscription to the Database Service is required on the Oracle Cloud. The subscription, which includes a Free Trial, may be obtained at https://cloud.oracle.com/database as shown in Figure 1. 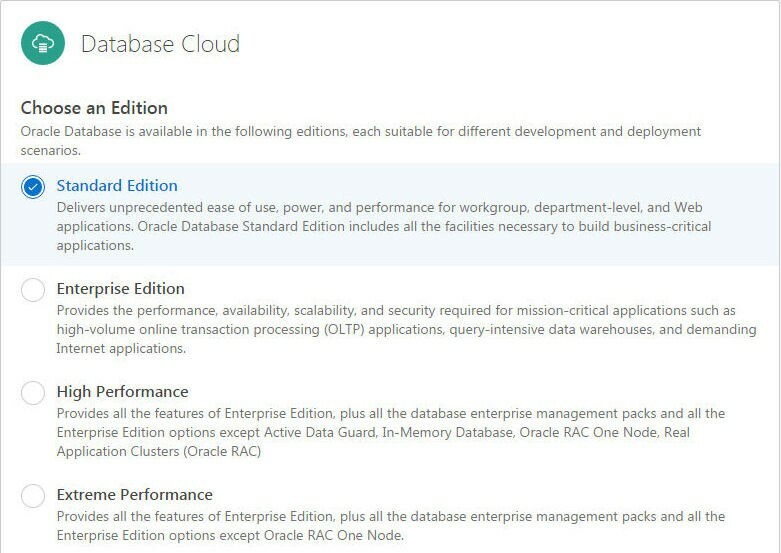 Several editions of Oracle Database are available including Standard, Enterprise, High Performance, and Extreme Performance. For workgroup and department level applications select the Standard Edition as shown in Figure 2. 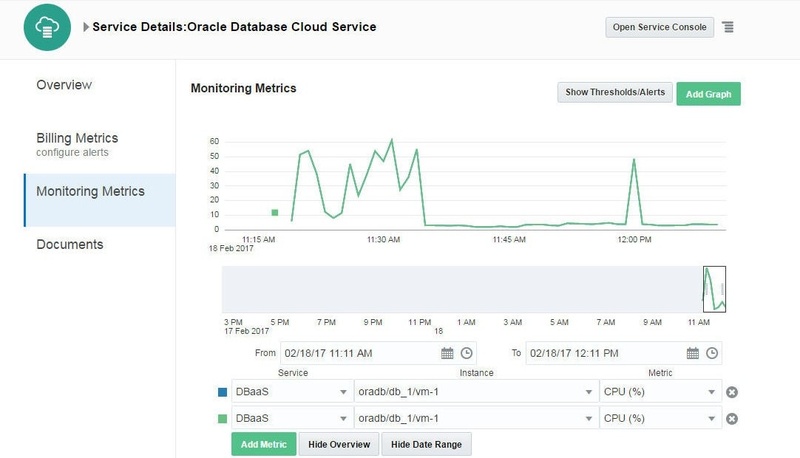 After you subscribe to the Database Service package on Oracle Cloud, you should receive an email notification from Oracle Cloud about the service being activated. 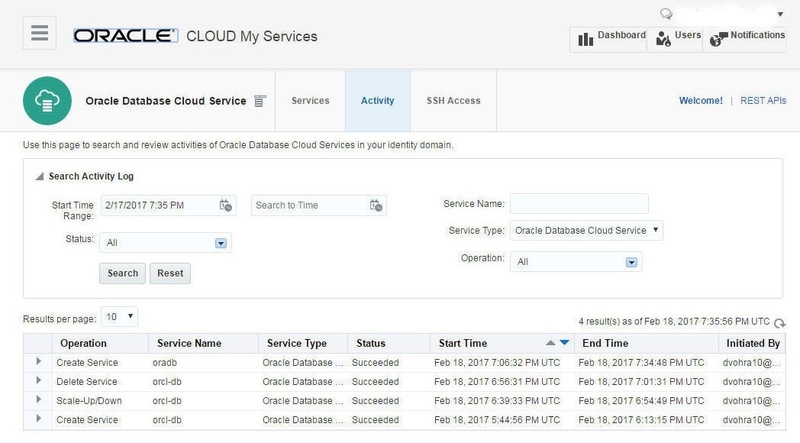 To access the Oracle Cloud dashboard navigate to https://myaccount.cloud.oracle.com/mycloud/faces/dashboard.jspx. in a browser, as shown in Figure 3. Included in the activation email message are the URLs for the different database services and the Username, Temporary Password, and Identity Domain required to access the services. 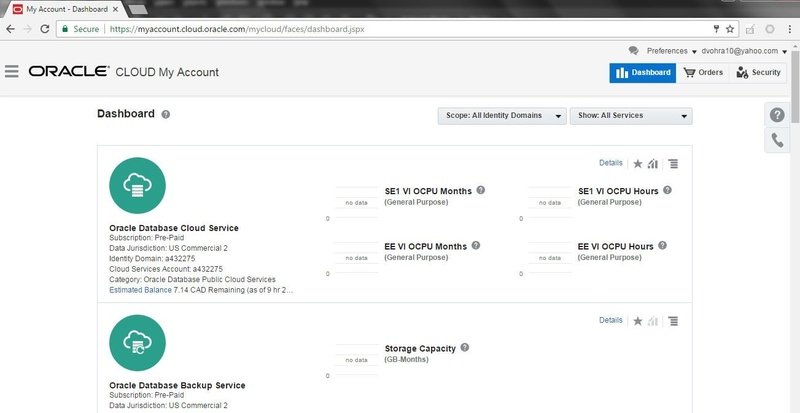 Login to the services dashboard at https://myservices.us.oraclecloud.com/mycloud/<identity domain>/faces/dashboard.jspx with the username, password, and identity domain, as shown in Figure 4. In the My Services Dashboard the Database service is for the Oracle Database 12c r2, as shown in Figure 5. The Compute service is for the VM. 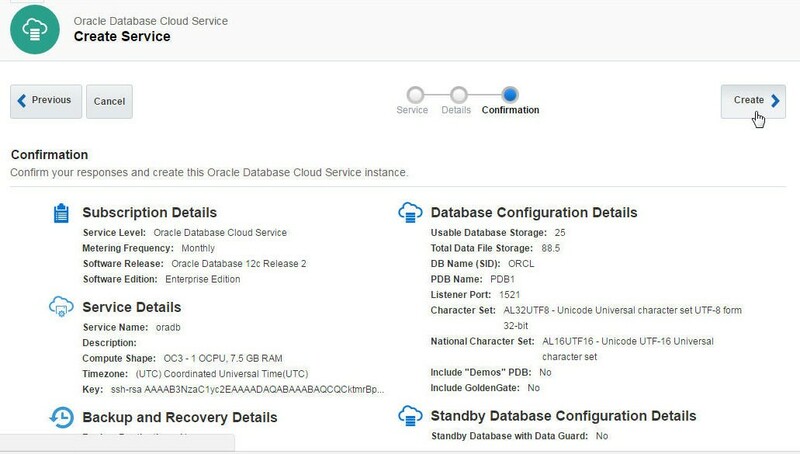 Click on the Database service to display the Oracle Database Cloud Service Details as shown in Figure 6. 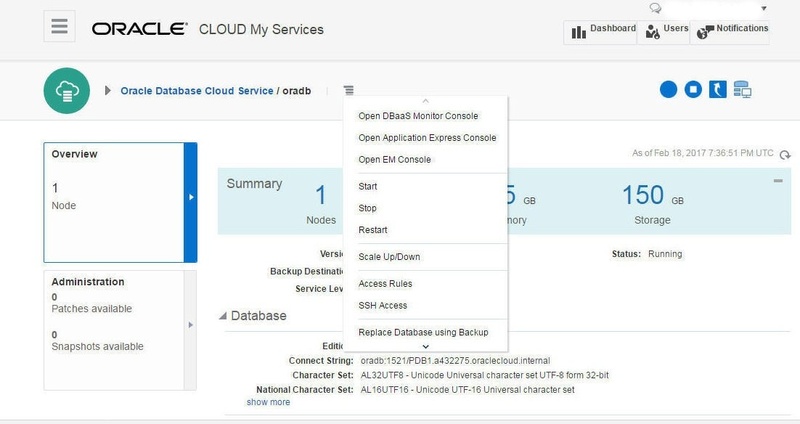 Click on the Open Service Console to display the Oracle Database Cloud Service console. Click on Create Service to create a service as shown in Figure 7. 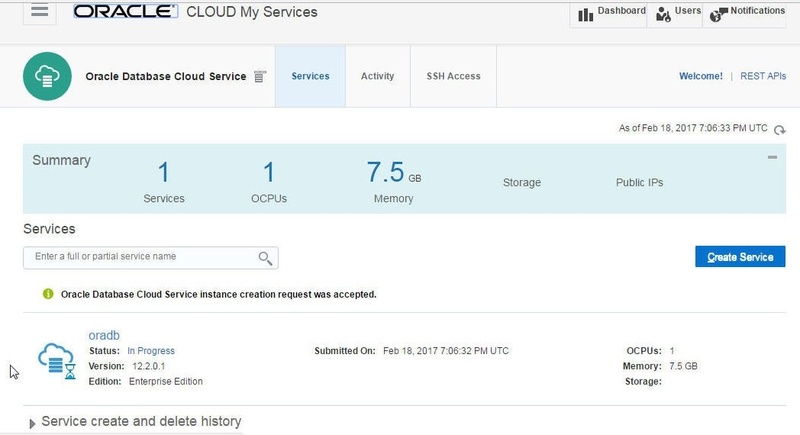 Specify a Service Name (oradb, for example) and select Service Level as Oracle Database Cloud Service. Select Software Release as Oracle Database 12c Release 2 and Database Type as Single Instance, as shown in Figure 8. Click on Next as shown in Figure 9. In Service Details specify the DB Name, which is also called the SID, the default setting being ORCL, as shown in Figure 10. Specify the Usable Database Storage (GB), Total Data File Storage (GB), and select a Compute Shape for CPU and RAM. To create a new SSH Public Key click on Edit. Select Create a New Key as shown in Figure 11 and click on Enter. A SSH Key pair gets created. 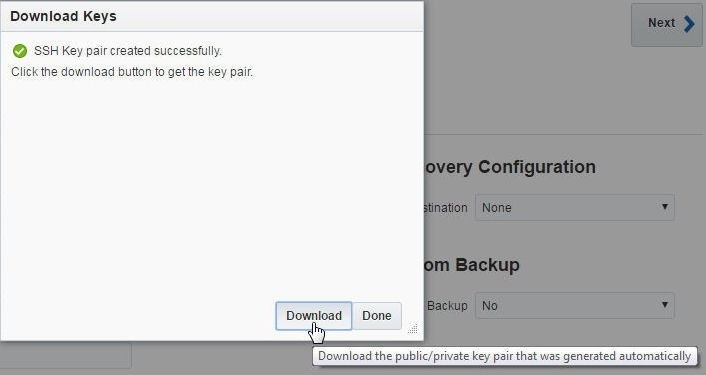 Click on Download as shown in Figure 12 to download the SSH Key pair, which includes the privateKey and publicKey. The SSH Key Pair gets downloaded as a sshkeybundle.zip file. Extract the sshkeybundle.zip file to an sshkeybundle directory. Keep default settings for Advanced Settings such as Listener Port, and Timezone, Character Sets as shown in Figure 13. 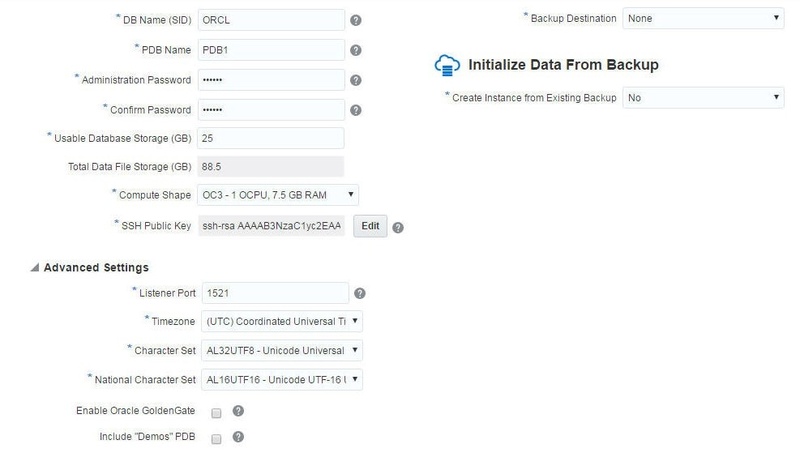 Select Backup Destination as None or select from one of the backup options. Click on Next as shown in Figure 14. Click on Create in the Confirmation summary as shown in Figure 15. 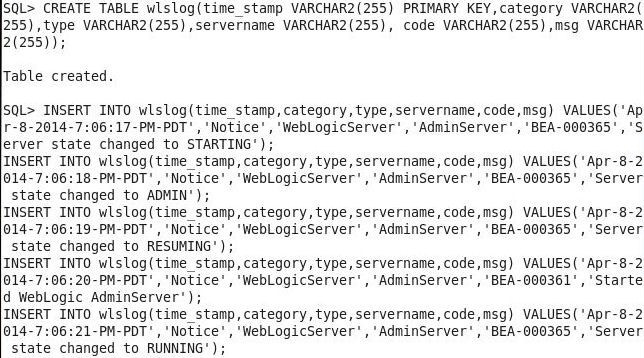 A new Oracle Database service begins to get created. The “In Progress” Status message should get displayed initially, as shown in Figure 16. After the service has been created Storage gets allocated and the “In Progress” message is removed, as shown in Figure 17. A Database instance gets created as indicated in the My Services Dashboard in Figure 18. Running instances are shown in a green circle with the number for the number of instances. Select the Activity tab to list the activity log, such as a service being created, scaled, or deleted, as shown in igure 19. 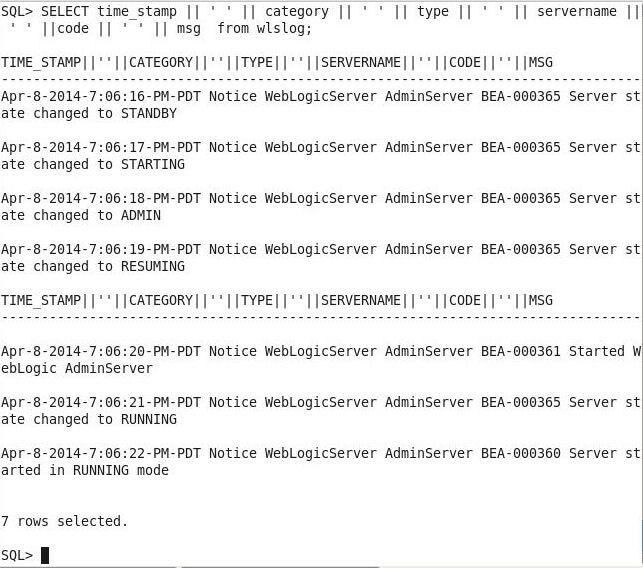 The "Service create and delete history" lists the time-stamped activities in the provisioning of a new database service, as shown in Figure 20. 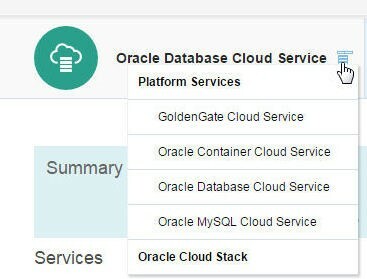 The Oracle Database Cloud Service consists of several services including Oracle Container Cloud Service and Oracle MySQL Cloud Service in addition to the Oracle Database Cloud Service, as shown in Figure 21. Click on the oradb service to view the service detail as shown in Figure 22. The service detail includes a summary of the number of nodes (1), OCPUs (1), Memory (7.5GB), and Storage (150GB), as shown in Figure 23. The Resources section lists the Public IP, SQL *Net Port, and SID, as shown in Figure 24. The options to manage the service include scaling up/down, obtaining SSH Access Key pair, and stopping, starting and restarting the database service, as shown in Figure 25. The Scale Up/Down Service includes options for selecting a compute shape that describes the OCPUs and RAM, additional storage, and the volume to which storage is to be added, as shown in Figure 26. Select the “Display monitoring information” icon to display monitoring metrics as shown in Figure 27. The Monitoring Metrics get displayed in the dashboard, as shown in Figure 28. 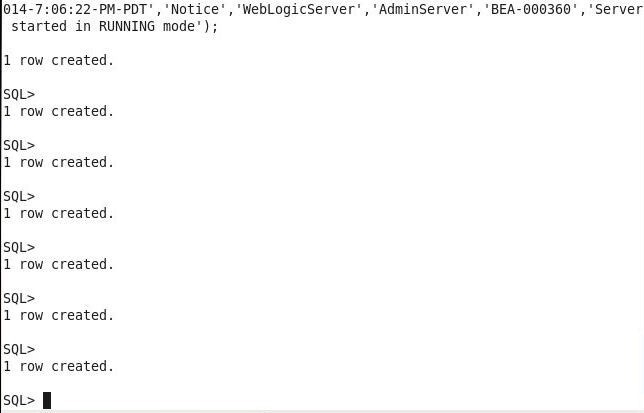 Next, to connect to the Oracle Database service, obtain the Public IP of the service from the console as shown in Figure 29. 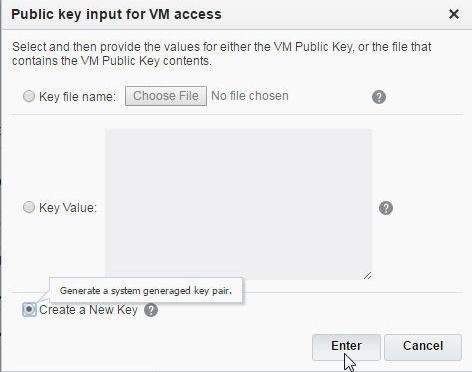 Set permissions on the privateKey to 600, which is to allow only the owner to read and write the privateKey. 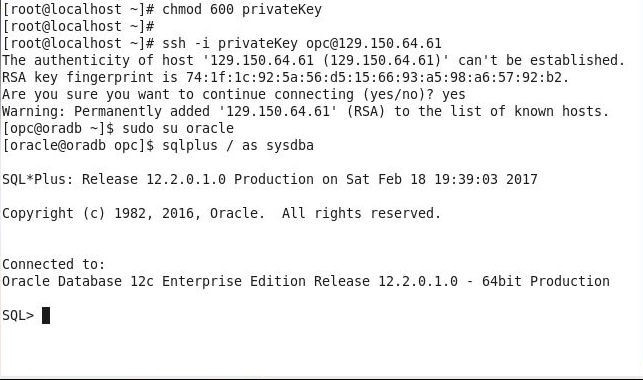 Using the privateKey and the Public IP SSH, login to the VM instance on which Oracle Database is running. The VM instance command prompt for user “oracle” gets displayed, as shown in Figure 30. To create a database table start the SQL *Plus as sysdba. The SQL *Plus gets started and the SQL> prompt gets displayed, as shown in Figure 31. Run the following SQL script to create a database table and add data to the table. A database table gets created, as shown in Figure 32. And, data gets added, as shown in Figure 33. Run a SQL SELECT statement to query the database. The database table data gets listed, as shown in Figure 34. To stop the database service click on the Stop icon as shown in Figure 35. Click on OK in the Stop Service dialog as shown in Figure 36. The database service begins to get stopped, as indicated by the “Database Service Stop request is accepted” in Figure 37. Oracle Cloud Platform is inherently collaborative, as the platform is hosted on the cloud and the database services are accessible to different team members who might be using the same database service. 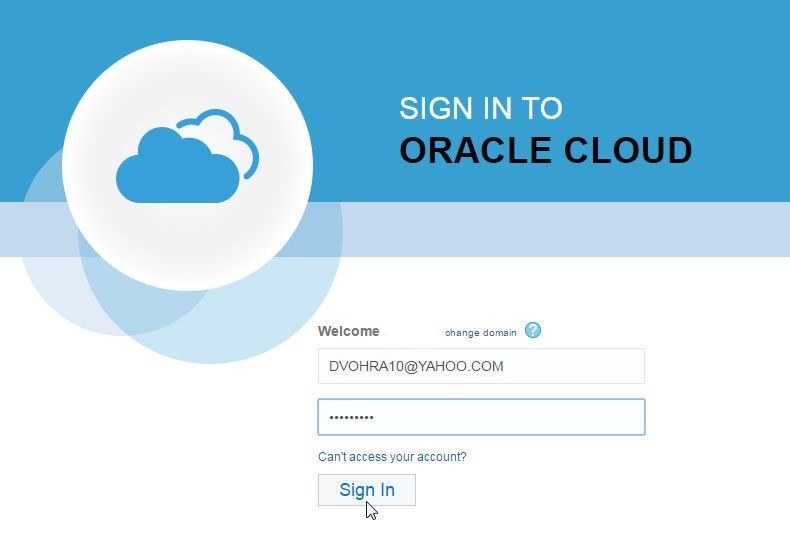 Multiple users may be added to the Oracle Cloud Platform by a cloud services subscriber. Select Users in the MyServices console to display the users and add new users. Subsequently, click on Add to add a user, as shown in Figure 38. In the Add User dialog specify the user information, as shown in Figure 39. 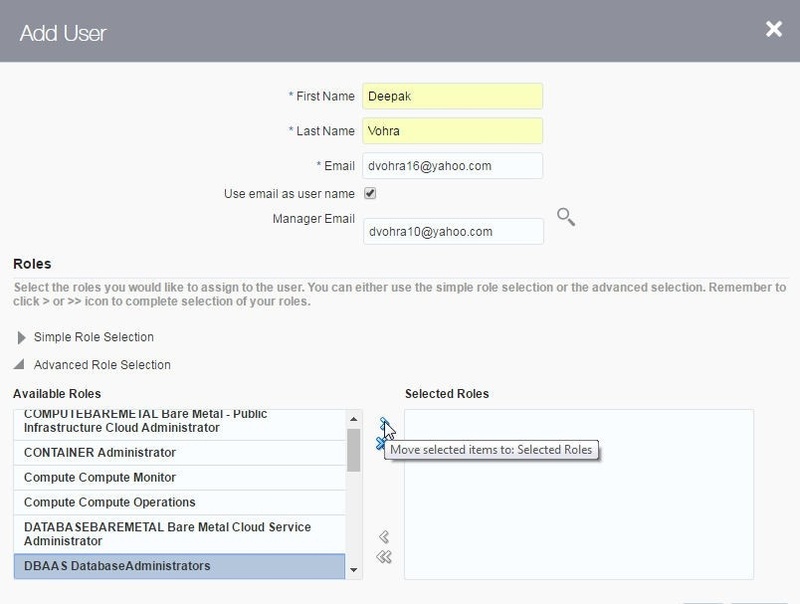 To assign roles to the user select the Service selection in Simple Row Selection. Select the Database Service. 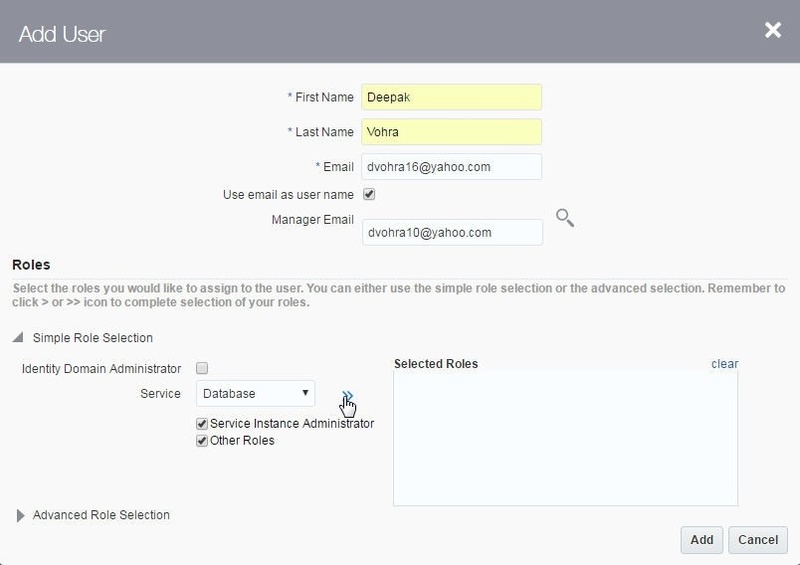 Select the Roles listed and click on the >> button to add the roles to the Selected Roles field as shown in Figure 40. Click on Advanced Role Selection to select advanced roles as shown in Figure 41. 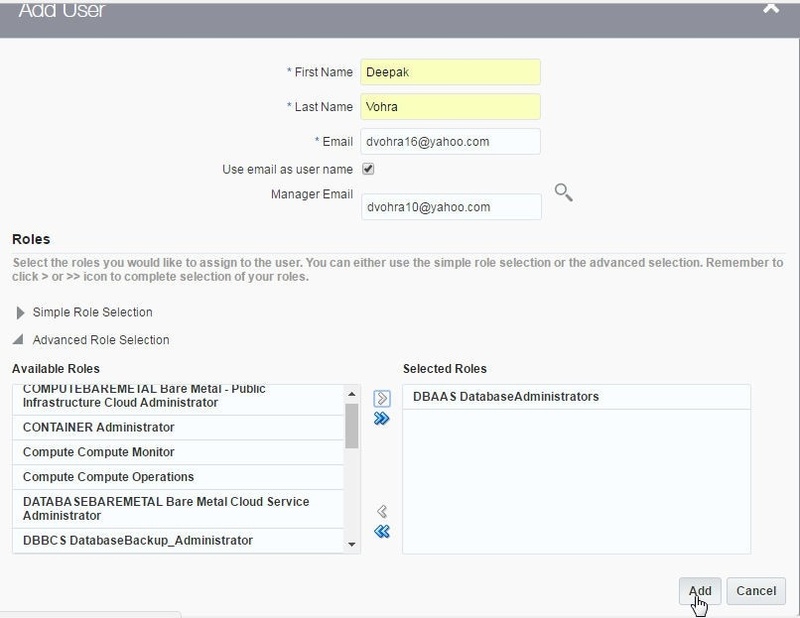 Select advanced roles such as the DBAAS Database Administrators role and click on the > button, as shown in Figure 42. Click on Add to add the user as shown in Figure 43. The new user gets added, as shown in Figure 44. 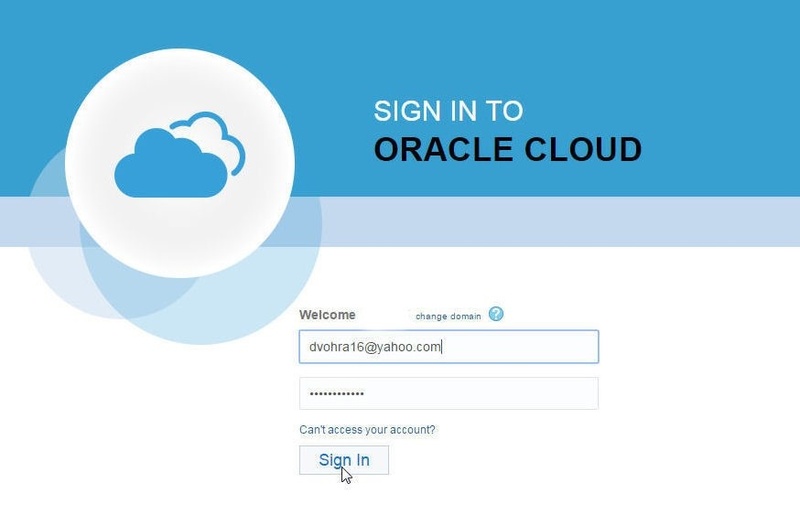 After a new user has been created the new user may login to the Cloud service, as shown in Figure 45. 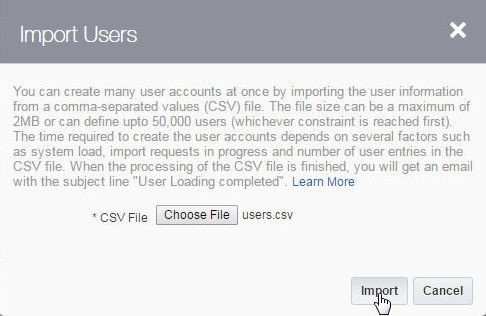 Oracle Cloud Platform also has the provision to add users in bulk by importing them from a CSV file. In this section we shall import user/s from a csv file. Create a users.csv (file name is arbitrary) file to list the users. The first line of the csv file must be in the following format for the headers for the values. Subsequently add the values for the different users in the same format as the headers. Users that already exist may also be listed and those users are not added again. 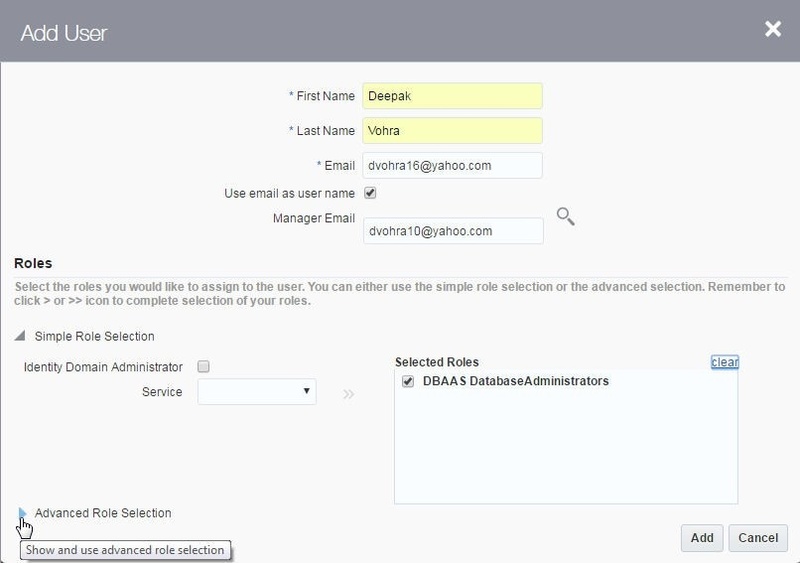 As an example, include the Admin and dvohra16@yahoo.com users, which already exist. The user email and login must be unique. The csv file must not be more than 2MB in size or consist of more than 50,000 users, whichever constraint comes first. To import the csv file click on Import, as shown in Figure 46. In the Import Users dialog click on Choose File to select the csv file to import. Click on Import to import users from the csv file, as shown in Figure 47. A message indicating that an import request has been submitted gets displayed, as shown in Figure 48. When the import is complete an email message is sent about new user accounts being added. The dvohra17@yahoo.com user gets listed, as shown in Figure 49. User information and user roles may be modified from the manage user service icon. 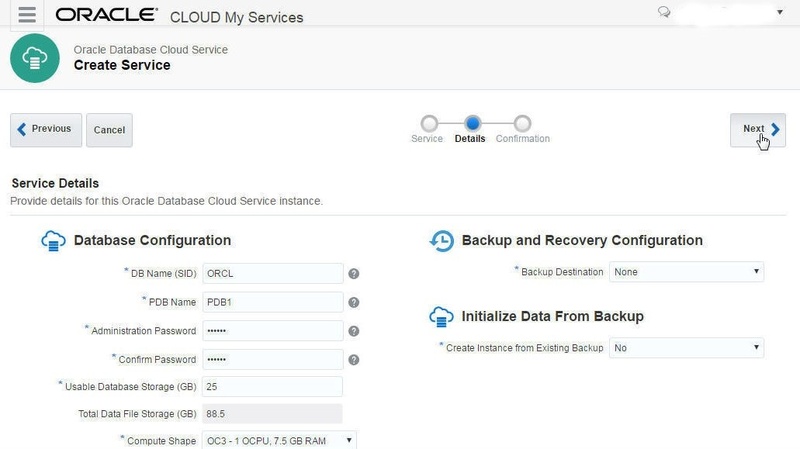 In this article we discussed a new feature in Oracle Cloud Platform Database as a Service (DBaaS), the support for Oracle Database 12c R2. We also discussed the provision for adding multiple users, including importing users in bulk.